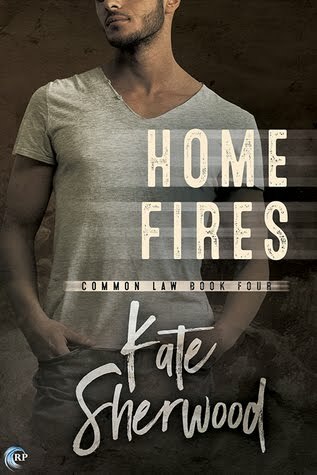 I absolutely loved the wrap up of Kate Sherwood's Common Law series. Home Fires was nearly perfect, in my opinion. The steam is still low, but there is a little. And Jericho and Wade are fantastic. Love them. It's the writing, though, that kept me reading. This review will be short, because I wish to be careful of spoilers, but this fourth book is also the best of the series. Things get wrapped up - though I won't promise any neatness, because everything does get messy. In Home Fires Jericho and Wade are openly seeing each other. Jericho knows the score and he knows Wade, and he's worked it out in his own head that he doesn't care that Wade is not on the same side of the law. Wade does have a moral compass when it really matters and when it comes to Jericho, Wade is fiercely protective. Home Fires is the most action packed of the series and the wrap up is edge-of-seat exciting. I loved every moment of it. And I loved how everyone came together when it counted and I loved how Wade showed his dedication to keeping Jericho safe. And they get their HEA! I'm happy I read this series and I recommend it to lovers of romantic suspense. It's good story telling with heroes that are far from perfect and story-lines that have kept me coming back for more. And, I wouldn't mind a spin-off series with what gets talked about in the epilogue -- that could be seriously fun. ARC of Home Fires was generously provided by the publisher, via Netgalley, in exchange for an honest review.